As a student, I was always fascinated with the prospect of learning to read faster. I read tons of blog posts about speed reading systems, tried all kinds of reading systems, and eventually realized that each of them only made reading exhausting and less and enjoyable. Recently, I started digging into real research on speed reading, which led to the speed reading mini-series that we’ve been going through over the past couple of weeks. I believe the answer is yes, and in this video I want to give you five methods that you can use to do it. The first video is particularly important, as it establishes the range of reading speeds that almost all skilled readers fall between: 200-400wpm (words-per-minute). Alright, let’s get into the tips. Method number one is simple: Read often, read widely, and read challenging material. I emailed Elizabeth Schotter, a postgraduate researcher at UC San Diego with a lot of research on speed reading and eye tracking to her name, to ask what contributes to a person being able to read faster while retaining good comprehension. “In general, fast (and good) readers tend to be good with language, have a lot of experience reading, and have a generally fast mental processing speed. So to some extent, there is some aspect of innate ability that relates to reading speed. It’s not all deterministic, though. Note that “have a lot of experience reading” implies that one way to increase reading speed and accuracy is to read more. Importantly, you will see more gains if what you read is varied (i.e., spans a diverse set of topics) and is relatively difficult (uses less common words, which will allow you to increase your vocabulary). To improve in all these areas, you have to do a lot of reading (here’s how to build a strong reading habit) – and you’ll make that reading count more if you choose books that span a wide variety of subjects and that use a wide vocabulary. One big problem I face when I’m trying to read is I’ll often get bored or find myself daydreaming after reading a sentence that sends me down a mental rabbit hole. Forge an “interest link” with the material. Try to link the book you’re reading with something you’re already interested in. A personal example: playing Assassin’s Creed 2 got me really interested in world history, which in turn made reading The Discoverers much easier. Find a better reading location. If you tend to get bored or sleepy when you read in your room, try reading at the library or in a coffee shop instead. When you’re going through assigned reading in a textbook, you’re often just trying to pick the most important facts and concepts out of a sea of less important information. A good way of increasing your reading speed in these kinds of situation is pre-reading. By looking at chapter and section headings, the table of contents, and the review questions and vocabulary terms at the end of a chapter before you start reading, you can essentially prime your brain to pick out the most important information. On a related note, it’s completely ok to skim the text when you’re doing these kinds of readings as well. Skimming is an important skill to master when you’re reading through dense material, as much of the information there just isn’t going to be very useful. One way you can skim effectively is by using the pseudo-skimming method; to do this, skim the paragraphs in your textbook until you come across one that contains the real “meat” of that section – the main ideas, important vocabulary terms, etc. When you find paragraphs like these, slow down to a normal reading speed and really take them in. To find these important paragraphs, pay close attention to the first and last sentences of each paragraph when you’re skimming. Also note formatting – bold and italic text, bullet lists, etc – and pay attention to what you learned from pre-reading. I think part of the motivation people have for trying to speed read is that they want to be one of those people who “reads 3 books a week”. I think that’s the wrong motivation to have. Goodreads is not an achievement list. Your bookshelf is not a trophy case. Just as worthy of questioning, though, is notion that the purpose of speed reading is to gain knowledge. This isn’t wrong, per-se, but focusing so much on reading speed can frame the process of gaining knowledge as something it’s not – a race. Our brains aren’t like those machines at the arcade that eat your tickets and tell you how many bouncy balls you can get from the prize counter. But sometimes we think they are, and it leads us to try to find ways to feed those tickets in faster and faster, assuming we can race past an idea in a book once and all the sudden “know” it and be able to apply it. What about reflecting upon what you’ve been exposed to, comparing it and merging it with your own life experiences? Sure, you might have read a fact and comprehended it – but what did you do with it? So here’s the last method: when you read, take some time to do something with what you learn. Take notes, write summaries, compare the material with your current view of the world, and use it the change the way you do things and make decisions. All of these things will help you to truly encode that information in a meaningful way. Hopefully some of the tips here can help you to read more, but ultimately it’s a matter of your priorities. If you want to read more, start reading and make a habit out of it. If you’d like some reading recommendations, check out my essential book list for students. Otherwise, let me know your thoughts down in the comments, and as always, thanks for watching/reading! Looking for More Study Tips? 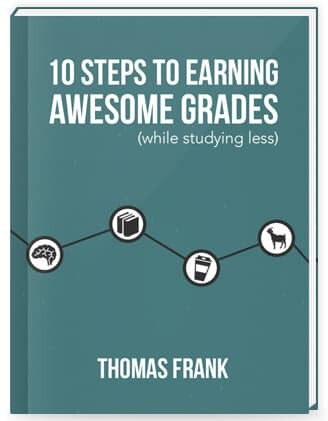 If you’d like to learn more ways to efficiently read your textbooks and learn more from them, you’ll find them in my free 100+ page book called 10 Steps to Earning Awesome Grades (While Studying Less). …and several more. It also has a lot of recommendations for tools and other resources that can make your studying easier. Special thanks to Elizabeth Schotter, a postdoctoral researcher at UC San Diego, for answering my questions about reading speed. Special thanks as well to Scott Berkun for taking the time to voice act the quote from his blog post. Now that we’ve reached the end of the speed reading series, what are your thoughts? Do you have other methods of increasing your reading speeds beyond these ones? If you liked this video, subscribe on YouTube to stay updated and get notified when new ones are out! It's not the starting salary. It's not how much upward mobility the job has. The one question you must answer is much bigger than that.